← CAN WE TALK ABOUT VIVIENNE WESTWOOD FOR A SECOND? Education, health and justice are all things everybody deserves a right to. Everyone. But in certain parts of our world, this is not apparent. Women especially are isolated in society due to lack of education, poor or no healthcare and a weak male-dominated justice system. Chime For Change is an organisation focusing on the awareness of lack of women’s rights in certain areas of the world. It is a global campaign to bring together women from all around the world to empower, inspire and influence anyone who’ll listen, and they should. 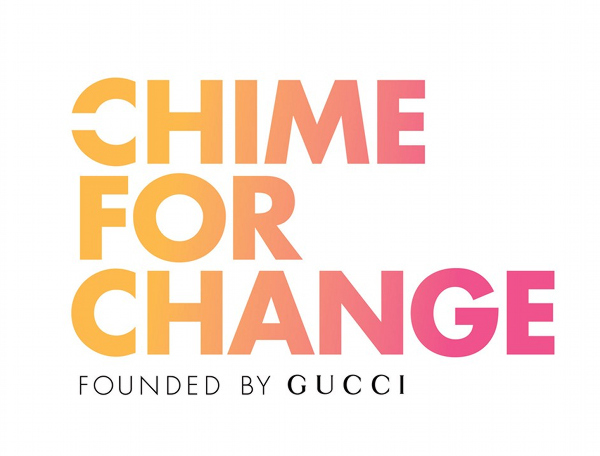 The organisation founded by Gucci creative director, Frida Ginanni, along with Beyonce and Salma Hayek have come together to organise a charity concert in London named ‘The Sound of Change’ on 1st June to raise money for this inspirational cause. Held at Twickenham Stadium, the concert will feature performances from artists such as Florence and the Machine, Ellie Goulding, HAIM, Iggy Azalea, John Legend, Timbaland, Rita Ora, Laura Pausini with of course a headlining performance from Queen Bey herself, as well as other acts to be announced. The Sound of Change will be televised globally to ensure maximum coverage and exposure. More infomation on global broadcasting will be available nearer the time. Proceeds from all tickets sales will go to the organisation, underwritten by Gucci to ensure that all proceeds go to worthy projects and causes. NONE OF US CAN MOVE FORWARD IF HALF OF US ARE HELD BACK. This entry was tagged awareness, beyonce, charity, chime for change, ellie goulding, fashion, florence and the machine, frida gianinni, girls, gucci, haim, iggy azalea, john legend, june, laura pausini, London, rita ora, style, ticketmaster, timbaland, twickenham, women. Bookmark the permalink.